So I just realized that it's been, like, two months since I've done anything with this blog. Sorry. Life really caught up with me, but I haven't been entirely inactive on the Disney front. Aside from my usual ephemera hunting I've been busy with trips to places that aren't Disney related and so on. Of course, in the middle of all that, I wrote and posted a series of four articles for 2719 Hyperion that amount to something like 9500 words and a year and a half of research - and it's still too short!! I'm the famous "least prolific", "token girl" of the group at 2719 Hyperion, possibly because I'm very careful about what I post there, but I like to think of the informal series I've started there as being something of the crown jewel of my history efforts - the most polished, researched, carefully collected stuff I have to show for myself. All too often I find history articles about Disney that are easy to read but fail to actually inspire an understanding of the past. With Buena Vista Obscura I hope to bring the past to life in a way that makes things that are fairly esoteric and obscure obvious and understandable to an audience which hasn't been going to Disney for very long at all. This means lots of pictures and lots of evocative information and solid reporting I can stand behind. This is also why it took me nearly a year between articles - I couldn't even tell a Vacation Villa from a Fairway Villa on sight until recently. Next I hope to cover the Polynesian's nightclub, Captain Cook's Hideaway, which was replete with alcohol and folk music. And if anybody else has a particularly obscure facet of WDW history worth elaborating on in more detail, I'm up for suggestions. I'm going to close out with an awesomely awkward image from the Village Restaurant - because I can - which I have posted here before but can only now explain properly. In the article it originally appeared in, See the Village. Tonight. Part Two..., I joked that these two 1970's vacation-goers were being treated to an impromptu fashion show. 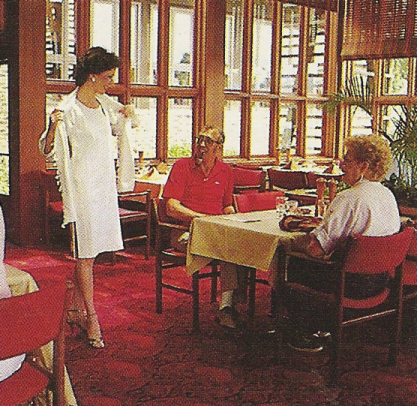 As it turns out, that's actually what is going on here, confirmed by a 1977 Walt Disney World News which touts "tea room modeling, 2 - 5" as one of the many attractions of the Village Restaurant.